(Vatican Radio) The kingdom of God is not a show, much less a carnival; it does not go looking for publicity. 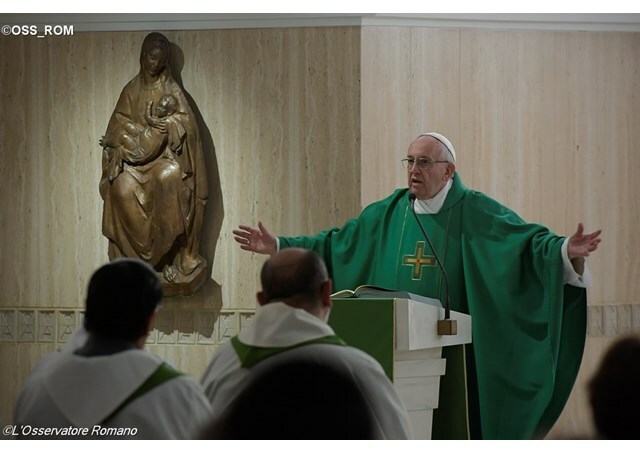 Its growth comes from the Holy Spirit, rather than from “pastoral plans.” That was the message of Pope Francis in his daily homily at the Casa Santa Marta on Thursday. The point of departure for the Pope’s homily was the Pharisees’ question in the day’s Gospel about when the Kingdom of God will come. It is a simple question, the Pope said, which can be asked in good faith, as appears in numerous passages in the Gospel. John the Baptist, for example, when he was imprisoned, sent his disciples to Jesus to ask Him if He was the Messiah, or if they should look for another. Later, in another passage, the same question is turned around: during His Passion, the bystanders say to Jesus, “If you are he, come down from the Cross.” Pope Francis said there are always doubts, there is always curiosity about when the Kingdom of God will come. “The Kingdom of God is in your midst”: That is the answer of Jesus. That is the “glad tidings” in the synagogue of Nazareth, when Jesus, after having read a passage from Isaiah, says that that Scripture is fulfilled “today,” in their midst.